Since the formation of Cigol Controls we have specialised in products aimed at the high vacuum industry. As well as experience with vacuum furnace and electron beam welding equipment we have a particular expertise in control hardware and software associated with vacuum deposition systems (both in the optics and semi-conductor industries). The photograph shows the control rack for a system designed, manufactured and commissioned at Cooke Optics Limited (we acknowledge with thanks permission from Cooke Optics for the use of this photograph and the associated information). 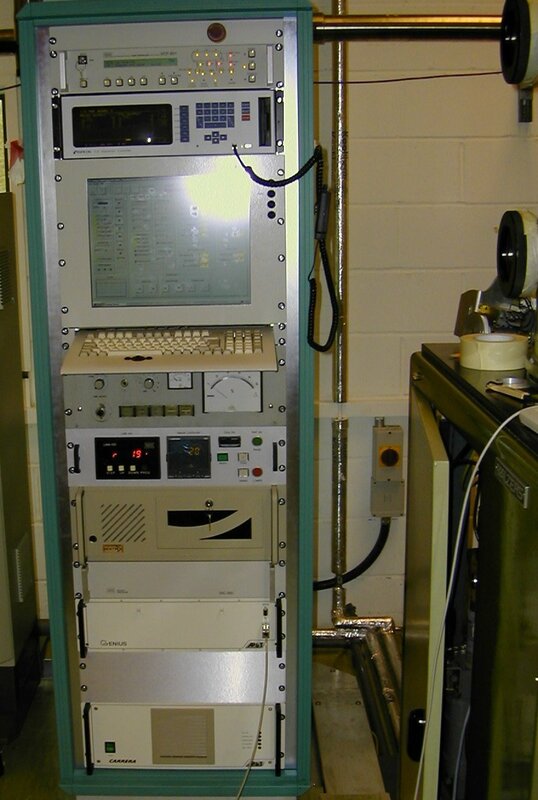 This system was supplied as part of an overall machine package by vacuum consultant John Gardner with whom Cigol Controls have a good working relationship. We have a free standing simulation of a typical coating control system that you can download now (1.2Mb) . This runs on Windows XP (recommended screen resolution 1024 x 768). The software uses software models of external hardware (such as the VCP-602 pumpstand controller, the GIC-301 gas inlet controller and the LNN-100 liquid nitrogen controller) to allow a complete process run to be simulated. After downloading the file run it to start the installation process. The standard windows uninstall system (Control panel / add/remove programs) allows it's convenient removal after use. The software may be used / copied or distributed as you see fit. Cigol Controls make no guarantee as to the suitability of the software for any particular use and will not be liable for any consequences of use. If you are cautious (or your IT dept will not allow you) about running an exe file on your PC then you can download a pdf file (3MB) which shows you some sample screen shots of the simulation software.